Metal Pipe Straps secure pipes to mounting surfaces. All straps have 2-holes that allow them to be installed with screws. Copper or copper coated straps are for copper pipe only. Galvanized straps are for black, galvanized, brass, PVC and ABS pipes. The 826-114-CP from PHD is a 1-1/4” Copper Plated Pipe Strap. 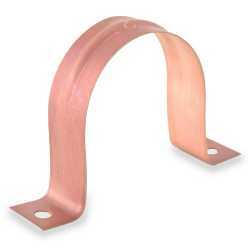 It secures 1-1/4" (1-3/8" OD) copper p.. The 826-112-CP from PHD is a 1-1/2” Copper Plated Pipe Strap. It secures 1-1/2" (1-5/8" OD) copper p.. The 826-200-CP from PHD is a 2” Copper Plated Pipe Strap. It secures 2" (2-1/8" OD) copper pipe flus.. The 825-200-EG from PHD is a 2” Galvanized Pipe Strap. It secures 2" pipe (black, galvanized, cast i.. The 825-300-EG from PHD is a 3” Galvanized Pipe Strap. It secures 3" pipe (black, galvanized, cast i.. The 825-400-EG from PHD is a 4” Galvanized Pipe Strap. It secures 4" pipe (black, galvanized, cast i..
Secures 1-1/2" pipe (black, galvanized, cast iron no-hub, bras..